A public branch exchange (PBX) phone system is a piece of physical hardware that’s installed on location, receives incoming phone calls, and distributes them to employees using sophisticated rules. PBX phone systems also give businesses access to professional calling features such as call transfers, auto attendants, call scheduling, and more. However, the definition of a PBX phone system has evolved since the emergence of internet-based telephony (VoIP) technology. Hosted and virtual PBX phone systems have made the need for physical hardware obsolete in many cases as the hardware becomes centralized and small businesses can access its benefits through the cloud. A number of VoIP phone service providers either offer a hosted PBX or include many of the features you’d get from a PBX in their phone service plans. For example, our recommended best VoIP phone service provider, Nextiva, offers a virtual PBX service. It’s important to note that newer VoIP-based PBX systems do not rely on landlines, so you can support an unlimited number of concurrent phone calls (or rather, as much as your bandwidth will allow). We’ll get more into these “hosted” PBX systems below. *Costs are approximate estimates. Initial costs include hardware, installation, and headsets and/or phones. Recurring costs include phone service. The original PBX phone system technology is landline-based and relies on a physical PBX hardware box. 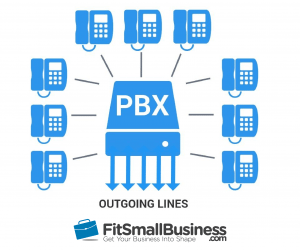 Just as the image above describes, traditional landline phone lines enter your office and then connect to a PBX box. Then, the phone lines are distributed to each desk in your office. Compared to newer systems, traditional PBXs can be very expensive to set up. In addition to the cost of the PBX hardware ($1,000 and up), you will also have to install traditional analog phone lines within and outside of your office if you don’t already have them. An IP PBX is very similar to a traditional PBX phone system. The only difference is that it uses digital phone signals internally, rather than analog-based landlines. An IP PBX can also accommodate businesses with multiple locations and/or remote workers. Because call routing and transfers are being handled via the internet, you can transfer to somebody in another office (assuming that they’re connected to the same network). An employee who works from home can even plug in an IP-phone and receive calls the same way they would in the office. An IP PBX system is still expensive because of the high cost of the PBX hardware ($1,000 and up) and installation. However, it can be a good option for larger businesses like a call center, since you generally don’t have to pay as much in monthly service fees compared to a hosted PBX, which we’ll describe next. A hosted PBX is a newer PBX phone system technology. It also uses digital VoIP phone signals; however, unlike an IP PBX, it’s a cloud-based system that does not require you to purchase or install a physical PBX hardware box. Instead, you can manage PBX features like call routing, transfers, auto attendant, and voicemail from your internet browser or smartphone. A hosted PBX offers the same portability as an IP PBX. Remote workers can connect a phone as if they were in the office. And when you’re on the go, you can even make calls from your cell phone using your business number. The primary advantage to a hosted PBX is that there’s no hardware to purchase or install, so the initial costs are much lower. Instead, users pay a monthly subscription fee per extension. This makes a hosted PBX the most economical option for small businesses. Setup is also very easy — just connect your phones with an ethernet cable and manage your call routing settings online. A virtual PBX is a “light” version of a hosted PBX. It works the same way as a hosted PBX, but generally offers fewer features. For example, the virtual PBX system Grasshopper can receive calls and route them to different employees based on predefined rules. What they can’t do, however, is actually give you phone service. Grasshopper can only forward calls to an existing mobile, landline, or VoIP phone number. A virtual PBX can be a good option if you need a professional-sounding phone system quickly and affordably. Setup time is virtually immediate. The downside is that a virtual PBX can be more expensive in the long-run, since you’ll need to continue paying your cell phone/landline bills on top of your virtual PBX subscription. 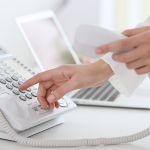 Which PBX Phone System Do We Recommend? For most small businesses, we recommend using a hosted PBX phone system from a provider like Nextiva. This is because it offers all of the phone features you would expect for your business, but without the costly initial hardware and installation costs of a traditional or IP PBX. A hosted PBX only requires that your business have high-speed internet service and phone handsets, although you can also use mobile phones or desktop softphones if you don’t want to purchase physical phones. All of phone system’s features, such as the auto attendant, phone tree, and voicemail boxes are managed online. This also has the added benefit of making the system highly scalable, as you can add and remove extensions at any time. An example of a hosted PBX phone system’s dashboard. Setup costs become more reasonable with a larger office. For example, an office with 50 employees may pay just $600 per seat, compared to $1,000 or higher for an office of 20. Monthly service fees can be lower than a hosted PBX. If you use PRI or VoIP phone service (as opposed to landlines), the cost tends to be much lower than a hosted PBX. Traditionally, a PBX was a bulky and expensive system that only enterprise businesses could afford. However, advances in phone systems have made hosted and virtual PBX technology accessible to most small businesses. Great guide, Graham. Although it completely depends on the needs and size of the business, I would recommend an on-premise IP PBX systeml. 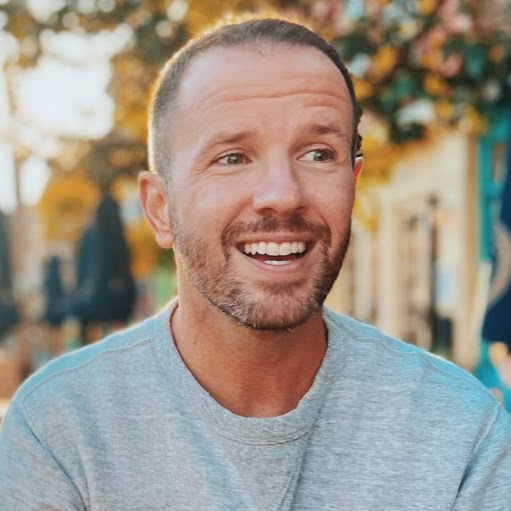 Since every small business eventually becomes a medium and then a large business, it would be good to consider a long-term plan. An IP PBX may be expensive initially but if you consider it for a long-term use, you will see that it is more reasonable. Can a novice get familiar with the PBX phone system within a week? I just got this job and the use of PBX system is really important and i happened to know nothing about the system. It depends on the specific system, but they’re generally pretty user-friendly. The provider should also offer useful help resources. In my honest opinion, I think a hosted phone system will provide better solution for a medium to large enterprise. I agree that a hosted PBX can still be the best option for medium and large businesses. The cost of hosted PBX services are decreasing, just as their features, and reliability are increasing.